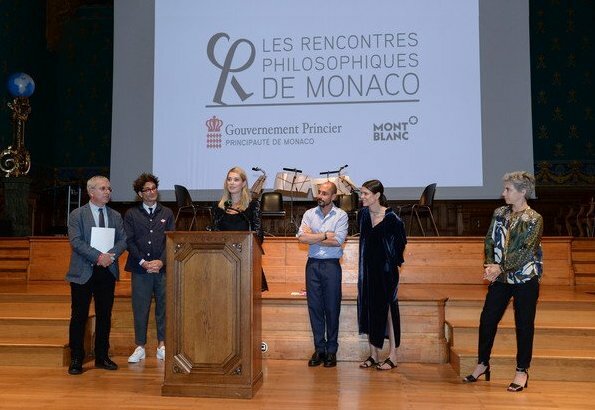 Charlotte Casiraghi attended the 2018 Philosophical Encounters (Les Rencontres Philosophiques 2018) held at the Oceanographic Museum. Charlotte released a book on philosophy a few months ago. 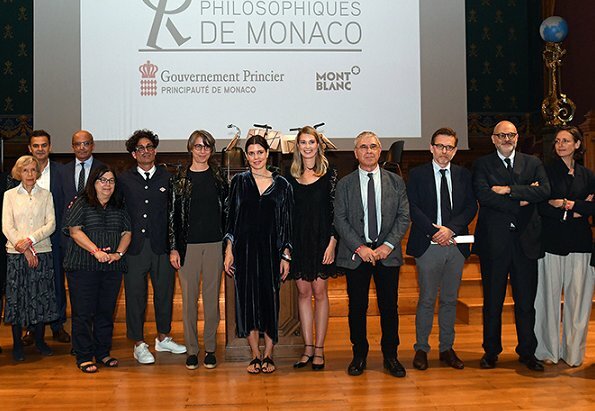 Founded in 2015 by Charlotte Casiraghi, Joseph Cohen, Robert Maggiori and Raphael Zagury, the Philosophical Encounters of Monaco aims to open up philosophy to the greatest number by proposing series of thematic conferences. I am sorry to say but the garment of Charlotte,looks like a Bikini Cover up one wears on the Beach. Nothing special it just hangs on her. Agree. Such a beautiful woman, but this outfit... oh no. A velvet pajama and sandals? Probably this is a poetic statement we all don't understand? A robe is a robe is a robe...? The color looks beautiful on her, however I prefer velvet during official cold temperatures. Did she just have a shower and jump in to her comfy velour bathrobe and scuffs?? None of the other people in that last photo seem too concerned about how they're dressed. 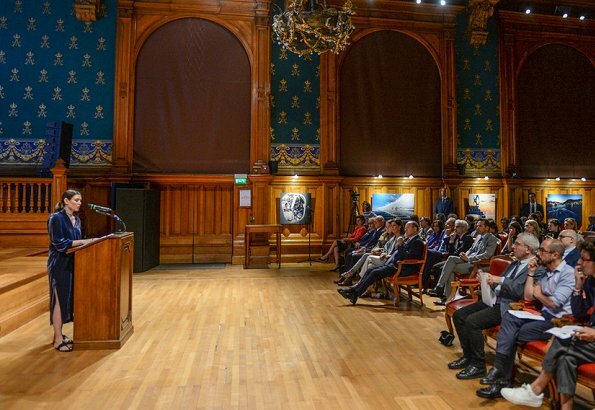 Perhaps this event was "Come as you are". There was a time when the phrase the absent-minded professor was coined. There have been many economic cycles and downturns since then such that society is a little hostile and not accepting a flaw or quirk as much. I get distracted from this social side of the news by my own life, but wasn't there a news item that she was expecting? So, you have one part intellect taking priority and one part maternity covering and this is what you get. I think she's telling us she really wants to do this philosophy thing. I see her family in the front row there to support her. 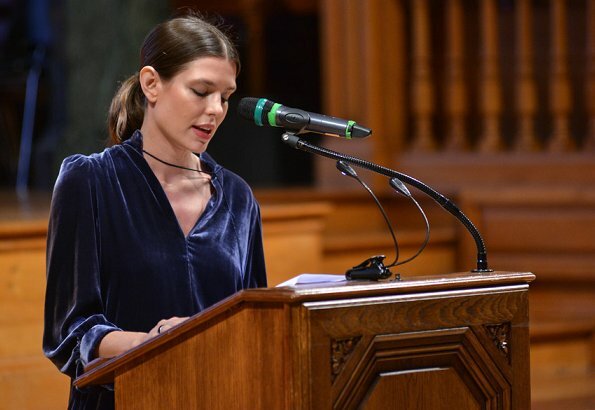 Ihr Outfit ist eine Katastrophe und respektlos dem Publikum gegenüber. So much better than anything else we see her wear. Maybe in conscious contrast to everything else we see her wear? She just looks normal, her hair, her facial expression - suit the occasion. Beautiful face, beautiful woman. Good to see her like this. Don´t want to offend you, but I fully agree. Finally she`s looking happy. Agree with both Anonymouses. She doesn’t look out of place and she has developed her own style and really seems not to give a toss on how people judge her. Good for her. So, was it just a rumor that Charlotte is pregnant? Several media outlets reported that she was, and that her wedding was postponed until after she gave birth. Angie, escribes igual que las que tanto criticas. Perdona, Anonymous, pero NO. Yo sólo he hablado de ropa. ¿Has leído algún ataque mío personal contra Charlotte? Hay comentarios tuyos muy groseros. Mentira. Yo vengo a hablar de ropa, aunque a veces contesto a las que sólo entran a insultar y propagar chismes contra la Reina Letizia. ¿Eres una de ellas? She is pregnant but why choose such an uggly outfit when there are beautiful dresses for pregnant women? 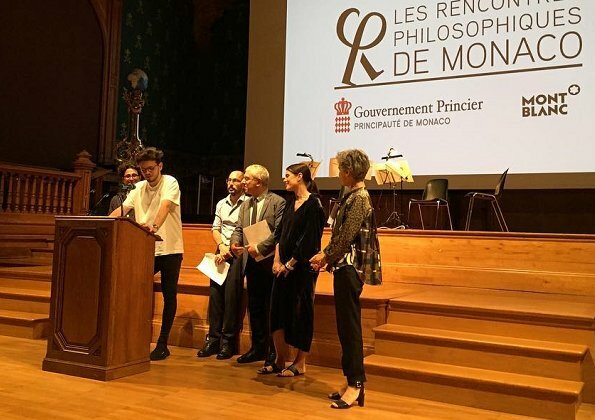 I believe that Charlotte Casiraghi of Monaco's study of philosophy at the Sorbonne will make a great contribution to an achievement of objective of the Philosophical Encounters. Kleidung ist heutzutage nicht nur ein Mittel zum Zweck, es ist auch Ausdruck des Respekts gegenüber den Mitmenschen und/oder dem Anlass - das vergessen viele. Different shoes could have saved the oufit. Es un vestido camisero de terciopelo, sin cinturón porque está embarazada. Lo que no me gusta es el cuello del vestido desnivelado. I find Charlotte quite fascinating. She is smart, beautiful and a free spirit. She is "beautiful and intellectual", "she can think and look good", "she got spirit and character", she is kind of Jo Stockton. A funny face. I admire that. Sadly neither Caroline or Stephanie's children inherited their Grandmother's style. i´m glad to see that her Beauty is back !